Lunar Knights is an adventure RPG with a dynamic weather system and upgradable weapons and shields. 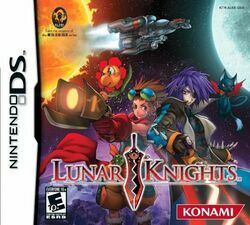 Lunar Knights is an ancestor to the Boktai series for Game Boy Advance. Lunar Knights is a dungeon crawling game, where you access and unlock new dungeons from a world map. During localization, it is said that a Terrennial was removed from the game along with two other game modes. This page was last edited on 16 March 2010, at 09:22.